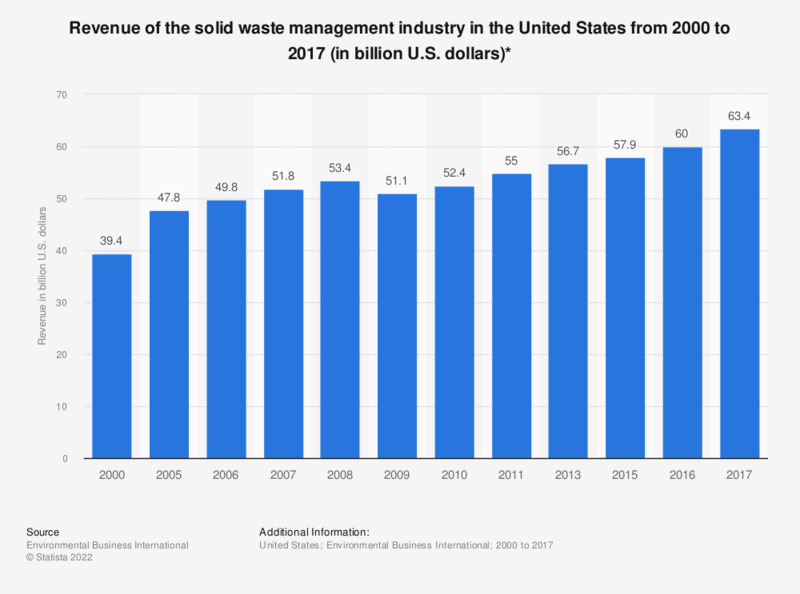 This statistic represents the revenue of the solid waste industry in the United States between 2000 and 2016. In 2016, the U.S. solid waste industry generated around 60 billion U.S. dollars in revenue. The annual revenue generated by Waste Management Inc. can be viewed here. * The figures from 2000 through 2010 are taken from the “Statistical Abstract of the United States”, published by the U.S. Census Bureau in September 2011. The figure from 2011 is taken from an Environmental Business International update. Other figures are compiled from other annual reports. The solid waste industry covers such activities as collection, transportation, transfer stations, disposal, landfill ownership and management for solid waste and recyclables. Everything On "Waste Management in the U.S." in One Document: Edited and Divided into Handy Chapters. Including Detailed References. Statistics on "Municipal Solid Waste in the U.S."